It's unclear what this "Dark Sanctuary" that you just discovered inside the Gravestone is supposed to be, except that it's centred around a so-called ancient monolith. Ghostly Valkorion confirms what you were already suspecting since chapter two - that he's basically in your head and will follow you wherever you go now. He tries to convince you that you two are on the same side, since you're both fighting against Arcann and Vaylin. Suddenly the ship is rocked by explosions - you've been found by skytroopers. Well, there's a surprise. You fight your way to your companions on the bridge. Koth says that he just needs a little more time to get the Gravestone ready, so you and Lana head out to hold off the attackers, which include Knights of Zakuul as well now. Just when it seems like things are getting pretty tight, you are joined by a female knight. Her name is Senya and Lana seems to have expected her. You continue fighting but eventually get surrounded as the knights use their Force powers to erect a barrier. Lana gets disarmed by a knight and seems to be about to be struck down, when suddenly time appears to freeze and ghostly Valkorion appears next to you. He says that if only you'd allow him a brief moment of control, he'd be able to save Lana from certain death. If you accept his power, he'll let you unleash a massive wave of Force power, knocking all your remaining opponents down at once. If you refuse, Lana gets struck down, but not lethally, as Koth and HK come out of the ship just in time to shoot her attackers. Koth is appalled by Senya's presence and doesn't want to take her along but there is no time to argue. The ship is ready to go but probably won't be able to pull itself up from the muck. 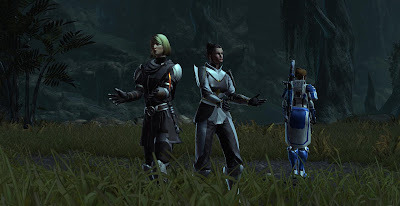 Lana and Senya help along with some Force power, and so do you if you're a Force user. If you're not, you stand off to the side and look around as if you're keeping an eye out for additional attackers while really just looking a bit silly. Finally, the Gravestone is in the air and majestically making its way into space... where you run straight into the Eternal Fleet. Your character agrees to man the cannons and somehow there are skytroopers in the corridors already that you have to clear out first. Those things are worse than sand, simply getting everywhere! The ships of the Eternal Fleet seem to be incapable of leaving their perfect formation and have worse aim than stormtroopers, so while they fire at the Gravestone by the dozen, she barely gets hit. When you fire up her cannon on the other hand... it turns out to be as powerful as the stories say, as its single shot chains onto two dozen ships and destroys them all. By that time, the hyperdrive is up and you can escape into hyperspace. 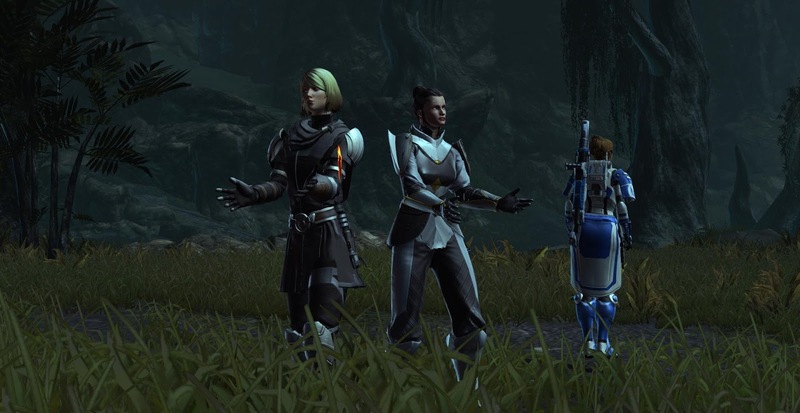 A shot of Arcann and Vaylin at the Eternal throne shows Arcann raging at his sister about your escape, though he then quickly backs off to say that he's not blaming her and that their father always held her back. It's another interesting little snapshot of their relationship that makes you wonder how well these two really work together or if there isn't trouble brewing in this sibling relationship as well. Meanwhile, the Gravestone didn't make it all that far before its hyperdrive and cannon gave up the ghost again, though fortunately you're at least away from the fleet. Koth complains about Senya's presence again, explaining that she used to hunt him after his desertion. He also accuses Lana of not consulting with him about her plan. Everybody storms off in a huff. You can choose whether you want to check up on Koth or Lana first. When you check on Koth, you get given a small bonus mission to collect tools to help with repairing the ship. He talks a bit more about how he impressed he is by the Gravestone and how he distrusts Senya. Meanwhile Lana is shooting Force lightning at a target dummy - if you didn't accept Valkorion's help earlier, she's also still in some pain from being wounded, yet if you did use his power to save her she grouses about how dangerous that was. She's also a bit sulky about Koth's negative reaction to Senya and reassures you that asking her for help was the right choice. Apparently she knew her from before she even met Koth. On your way around the ship you run into HK. If you agreed to take the exiles aboard, he mentions that they are settling in nicely, as well as snarking about the "meatbag bickering" and contemplating what unexplored passages on the Gravestone might contain. You can tell him to assist your other companions or let him continue to roam free. Finally you find Senya in the Dark Sanctuary and talk to her. She seems oddly chipper after the very serious demeanour she put on earlier and explains that while being a knight means everything to her, she's not letting it define her, which I feel comes across as a bit of a contradiction. Either way the point is that she displays a very different personality when she considers herself "off duty". You talk about your reasons for opposing Arcann and she says that he's become oppressive and cruel, while most Zakuulans are still too caught up in their grief for their deceased Emperor to see what Arcann has become. 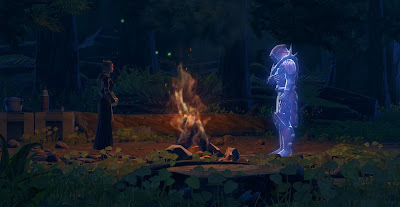 After your conversation you are treated to a shot of a slightly older looking Satele Shan meditating by a campfire in a forest - looks like it could be on Tython. She talks about how Valkorion lives, but something is different, and a disembodied voice responds to her. 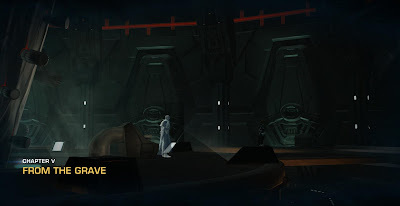 It's the ghost of Darth Marr, who concludes that Valkorion's presence in the Force is deceptive: "Even when my life depended on it, I did not see him properly until it was too late..." This is a throwback to chapter one and reminds us that the Vitiate/Valkorion connection is not quite as straightforward as it seems. This chapter feels a bit like an in-between chapter, in the sense that the Gravestone needs to get off the ground but it doesn't really take that long so... we get some more skytroopers to fight (whether it makes sense or not) and random bits of companion dialogue that don't really tell us that much (except that we get introduced to Senya, but we don't learn a whole lot about her yet other than that Koth hates her). However, this chapter also contains several very important events. First there is Valkorion offering to "help" you for the first time. It comes at quite a crucial moment, because after having been told beforehand that our choices would matter and that we could lose companions, the threat of Lana's death seems quite real to the player encountering this scenario for the first time. Like in chapter one, I think a lot of people were probably disappointed when it turned out that their decision didn't "matter" because Lana survives either way. I think you can take a different lesson away from this though: don't trust Valkorion! It's not clear whether he's intentionally trying to deceive you or simply doesn't really know whether Lana would die from the attack or not, but the point is that he's trying to make you believe that he knows what's going to happen and it turns out that he's wrong. This is something to keep in mind for future chapters. The next important event is the Gravestone blowing up a significant chunk of the Eternal Fleet. While it's a bit dubious that she seems to be able to withstand so much fire (in the same way that stormtroopers in the original trilogy have ridiculously poor aim), it's certainly impressive that she's that powerful, which makes the notion of your little group going up against Arcann and the Eternal Fleet at least a little bit more believable. 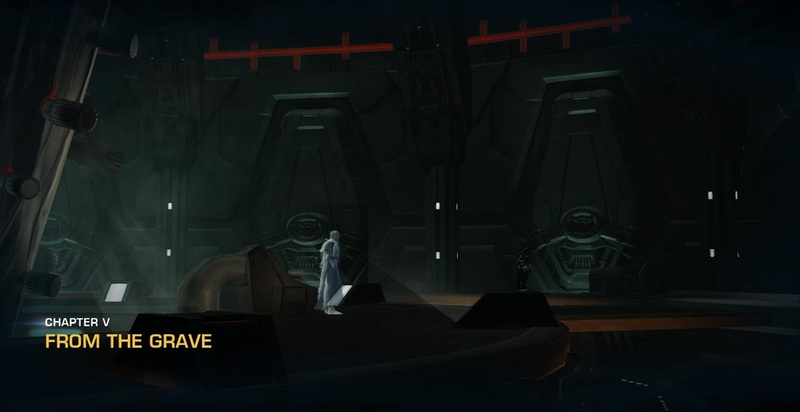 Finally, we have the surprise ending of Satele meditating on what's been going on and chilling with Darth Marr's Force ghost! Was he a good guy in the end for standing up against Valkorion? Still, why is he hanging out with Satele? What is he talking about when he says that he didn't see Valkorion properly? Lots of questions! The one thing that bugged me about this chapter is that you spend quite some time hanging out in this mysterious Dark Sanctuary but you never get a chance to talk about what it is - it seems a bit ominous to rely on a ship that contains a chamber like that. Valkorion seems to feel right at home at it, and Senya appears to be comfortable around it as well, yet there is definitely something sinister about it. In hindsight, the chapter's title, "From the Grave", is quite clever, as it can apply to multiple things: the Gravestone rising from the swamp, Valkorion trying to influence events even though he's supposed to be dead, as well as Darth Marr sharing wisdom from the great beyond.